Apple has released a new app for iPhone and iPad, the previously announced video tool Clips. 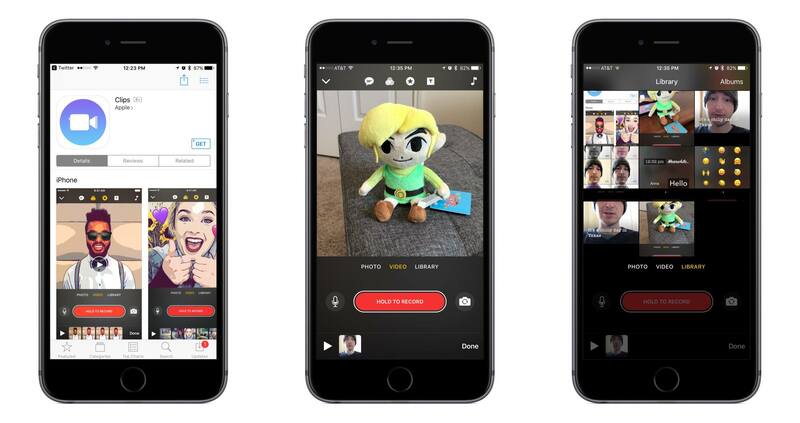 Apple describes Clips as an app "for making and sharing fun videos with text, effects, graphics, and more." Essentially it's a stripped-down version of a video editor like iMovie, optimized to make edits fast and user-friendly on mobile. Its key focus is allowing you to shoot seconds-long clips and string them together into a video worth sharing. Getting started with a new clip is simple: you just press the big, red 'Hold to Record' button and video will record until you release it. Optionally, you can also take an existing image or video from your library and import it to the app. Whether you're recording something new, or editing existing content, Clips will always require your video to fit a square orientation. This might annoy some people, but it makes sense as a format that works well when viewed in either portrait or landscape. Once you've captured a photo or video, Clips provides a variety of tools with which to quickly edit that video. Content can be overlayed on top of the video, like resizable emoji, text bubbles, and more. Prisma-like filters can be added, as can audio soundtracks. One of the neatest tools is called 'Live Titles," which takes any words spoken while recording and creates animated captions out of those words in real-time. This eliminates the sometimes-tedious task of writing captions in later. 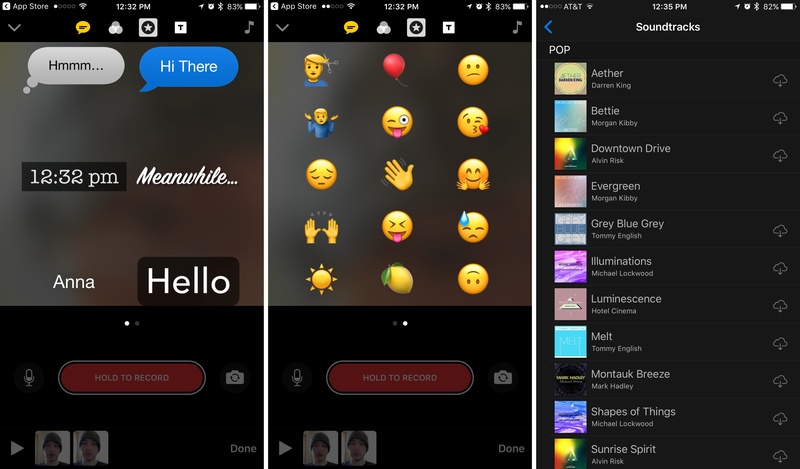 When you're done recording and making edits to a video, sending it out into the world is handled by the share sheet, which contains all of the standard avenues for sharing content – Facebook, Snapchat, Twitter, and whatever other apps you have installed. A clever feature Apple has added to the share sheet in Clips is that if the app detects that one of the people in your video matches a face from your photo library, or if you said someone's name during the video, the share sheet will list those people as suggested options to share your video with via iMessage, alongside a grouping of people you've recently messaged. Overall, Clips is well-polished, packed with tools, and it does well what it's designed for. The recent onslaught of ephemeral, short-form video content on services like Snapchat and Instagram was clearly a strong influence on Clips' creation. And while I haven't gotten into the 'Stories' craze myself, I'm still expecting to be a somewhat-regular Clips user. Whereas I find something like Instagram Stories intimidating because I don't like the pressure of shooting and immediately sharing something. 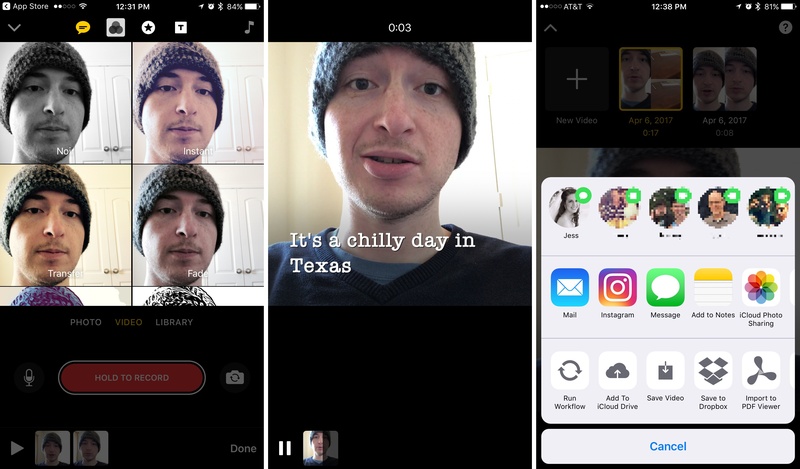 Clips allows those who want to move that fast to do so, while people like me can take their time – I can record something, save it to the Photos app, maybe share it with my wife or a friend, and if I end up really liking it, I can later share to social media. Clips is available on the App Store. Downloading it requires that your device is running iOS 10.3 or later.